Is Barnet Capable of Managing its Outsourced Contracts? Next Tuesday is the Performance and Contract Management Committee meeting. Reading the 119 page Performance Monitoring Report it makes my heart sink at how poorly some of the contracts are being monitored and managed and how performance management seems to be a box ticking exercise. You can read the report here at agenda item 7. I have submitted a series of questions on a number of agenda items set out below. It will be interesting to see the responses. Can you explain why the Commissioning Group budget has risen from £20.2 m in 2016/17 to £35 million in 2017/18? On page 42 risk AC028 identifies the lack of a fully functioning case management system. Who is responsible for managing and maintaining this system and how confident are you that the draft plan to implement remedial works is actually working? On page 44 reference is made to Barnet’s Children’s Commissioner and her report of January 2018. At 4.23.3 of her report she made specific reference to the role of the PCM Committee, raising a question over whether that Committee has the capacity or capability to scrutinise and monitor complex children’s services effectively. Why was this not highlighted in the papers for this meeting and how are you going to actually address this serious concern? The Children’s Commissioner also noted that there is a culture in Barnet of over optimistic and over reassuring reporting to members. How confident are you that the reports you are receiving in these papers are not over optimistic and over reassuring and what steps are you taking to ensure that culture is changed? At page 94 there is a report regarding the performance of Cambridge Education. As part of this contract, school meals were subcontracted to ISS. School meals was a profit centre generating £240,000 of profit before it was outsourced and the business case identified it as a major source of additional income generated outside the borough to support the business case. Why is there no information on the financial performance of the ISS subcontract and will you provide an update of ISS’s current financial and operational performance? At page 97 it notes that there will be an additional charge for Revs & Bens work from DWP. In 2016/17 Capita charged £330,000 for additional Revs & Bens work plus £98,000 for face to face support. How much is Capita likely to charge in 2017/18? At page 99 the reports states that there is a rebate from Comensura and administration charges to other services, totalling £1.986m. Please can you clarify how this rebate from Comensura is calculated, and what proportion of the £1.986m it represents? One of the CSG contract variations identified in Table 12 is for £1,004,038 for dilapidations to NLBP Building 4 “to increase the funds to cover cost until October 2018”. Given that Barnet should have existed NLBP 4 in October 2015 why are we still paying into a dilapidations fund and why are we paying it to Capita, not the building freeholder? At Page 103 the report states we are paying £78,908.65 to Capita to assist with Family Services recruitment. Given that we paid Capita £248,000 for the same task last financial year are you sure this further payment represents value for money? At page 106 the report provides details on Re’s financial performance yet there is no mention of how much additional revenue they generated, a key component of the overall financial performance. Please can you tell me how Re are performing against revenue generation targets? To what extent has the contingency plan recognised that Capita provide services through a range of different service companies (for example pensions administration is operated through Capita Employee Benefits Limited) and that with such a complex operating structure some companies might continue to trade while others are placed into some form of insolvency measure? To what extent has the contingency plan recognised issues such as retention of title, where for example if a Barnet contractor has purchased but not fully paid for essential equipment (such as IT hardware) the original supplier may uplift that equipment? To what extent has the contingency plan recognised that before a company goes into some form of insolvency measure, it may experience a prolonged period where cashflow is highly restricted, preventing investment in key equipment and failing to replace staff that leave which would have a highly detrimental impact on service standards? Have you taken specific professional advice from an insolvency practitioner, for example from the external auditor BDO, to ensure the contingency plans are robust? At the Audit Committee of 31st January 2018 the Chair, Cllr Rayner, said that he was referring the issue of gainshare on the CSG contract back to this committee for a review. There is no mention of this in the forward work programme. When is it scheduled to take place? You get what you pay for - should Barnet residents pay more? Next Tuesday the all powerful Policy & Resources Committee will assess whether to increase Council Tax or not. There is a recommendation that they should add a 3% social care precept. Social care is in crisis, not just in Barnet, but throughout the UK so this makes sense. However, this money is ring fenced and the council are obliged to prove it has not been used for other purposes. The Council are also allowed to increase Council tax by a further 2.99% without having to hold a local referendum but the recommendation is that this should be frozen. This follows a pattern with Barnet having frozen or cut Council tax every year since 2010. In 2016/17 they did include a 1.7% social care precept but this mirrored a 1.7% reduction due to the Olympic levy coming to an end - so no overall net increase. The problem we have is that Barnet have been using reserves to make up some of the shortfall and they are getting to a point where they will reach the minimum threshold a local authority is required to hold. Barnet are proud that they have made real term cuts to council tax of 20% but that has a very significant cost in terms of the reduction of services. Most departments are being required to cut their budgets, including services like Children's and Adults. For details of all of the budget cuts you can read them here with a summary below. Currently Barnet is being propped up by a central government grant called New Homes Bonus which is linked to the number of new homes are built. This year it is roughly £10 million so you can see why Barnet is so keen to push through every new housing development. However, this grant is being cut and there is no certainty as to how much longer it will continue. So now we come to the tough bit; should residents be prepared to pay a little bit more? From my perspective the answer is, unfortunately, yes. Failure to do so is just building problems for the future. I was talking to someone about this the other day and it is a bit like only paying off the minimum balance on your credit card each month - you know it's not enough but you don't have to worry about it this month. 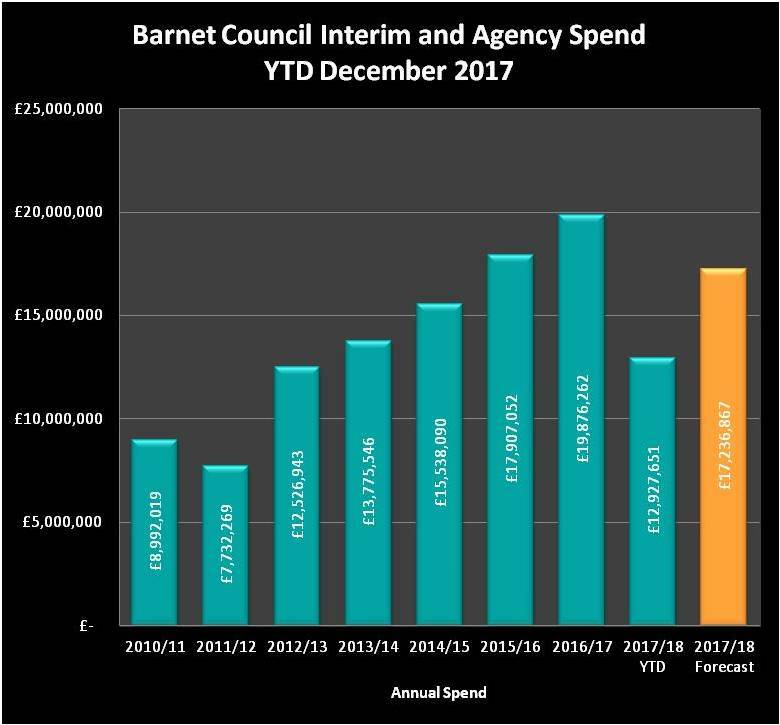 Even if Barnet had taken a very modest 1% increase in council tax each year, it would mean we would have around £14 million more to spend this year, negating the need for this year's cuts and borrowing from the reserves. The argument for not taking a council tax rise is that many families are hard pressed financially. That is also true but this whole problem has been brought about by central government cuts to local authority financing and all three constituencies returned Conservative MP's who have voted through these cuts. I would also say that there are some savings still to be made at Barnet Council. We know about the very expensive PR & Communications team which you can read about here and the huge salary rises for some of the most senior staff but ultimately people have to be realistic and pay for key services like Children's and Adult Social Care. I have raised a number of questions regarding the budget which I have set out below and I will update you when I get some answers. At the Policy & Resources Committee last year the detailed revenue budget showed an “original estimate” for 2017/18 of £270,333,880. This included £ 6,863,000 for Additional Income from Council Tax. In this year’s detailed revenue budget it states the “original estimate” for 2017/18 was £277,196,880 with the Additional Income from Council Tax left blank. How can the “original estimate” have changed and what has happened to the missing £6.8 million? Given that the external auditor said in the audit completion report “there is little margin available in reserves and balances to support any further revenue budget overspends or slippage on savings plans and management will need to revisit how these reserves are being utilised in the event of continued pressures on budgets”, do you think it is wise to recommend a budget that recognises pressures yet freezes Council tax and depends on reserves to make up some of the deficit? Given that the Council will be unable to levy a social care precept in 2019/20, and that you are forecasting a budget gap after savings and reserves of £5.965 million, even with a 2.99% council tax increase, do you think it is fiscally responsible to freeze council tax yet again this year? The report states that “it may become necessary to go to alternate weekly collection if recycling rates continue to plateau and/or the savings identified are not realised” does this two weekly collection refer just to residual waste or would it include two weekly collection of recycling and food waste as well? 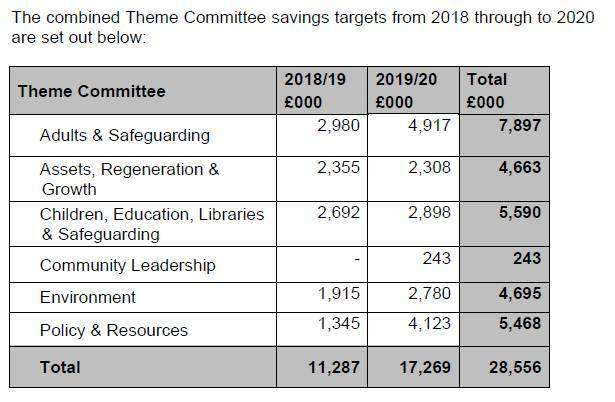 How confident are you that the savings forecast on the Your Choice Barnet contract aren’t simply adding to the deficit in The Barnet Group and what safeguards are in place to stop that happening? Can you clarify how the £300,000 decrease in concessionary fares will be achieved? Under Central Expenses can you clarify why, in the expenditure breakdown, the current estimate of capital financing for 2017/18 is approximately £11 million less than the original estimate for 2017/18 but that the original estimate for 2018/19 increases by £12.6 million over this year’s current estimate? Are the efficiency savings on third party contracts identified in the Children’s & Family services budget net or gross of any gainshare payments to Capita? Given the inadequate OFSTED report rating of Children’s Services and the fact that the original budget was overspent by £6 million to try and help resolve some of the issues identified, is it wise to forecast savings for 2018/19 of £2.1 million on Children’s Family Services for 2018/19? Why are no financial savings shown against the HB Law service – have they achieved the pinnacle of efficiency? This has been an eventful week in Barnet. Capita's share price has crashed, with Barnet having to draw up contingency plans in the event of its failure. The same day as the crash, the Audit Committee heard a catalogue of Capita failures. 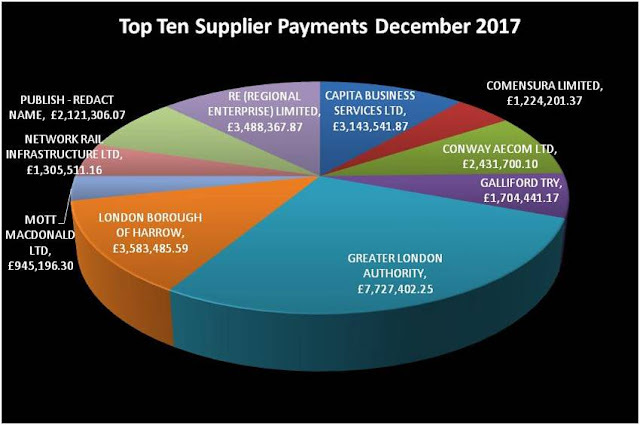 Today I have published the supplier payments for December 2017. 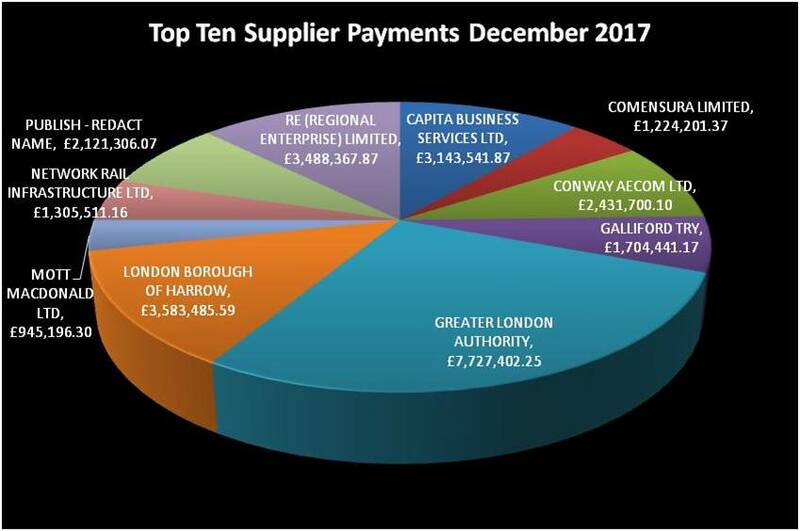 As you can see from the chart below, we are still paying Capita/Re a fortune even though we have made huge advance payments to them on both contracts. The monthly bill for agency and interim staff is declining slightly but it is still forecast to hit £17.2 million by the year end. With a commissioning council and so many services outsourced it is beyond belief that we are spending more on agency staff now than we were when no services were outsourced. Below are the charts showing the payments to Capita and Re as well as for Interim and Agency staff. I have had a number of discussions today with people asking whether the contract with Capita can be terminated. I have referred them to the contract (page 167) on the Barnet Council website which seemingly makes it clear that, yes, we can terminate the contract. We would have to pay a fee (which Capita do not want me to see as explained in an earlier blog) but given the massive cost of the current contract that may well be a price worth paying. What is important now is to start discussing what a redesigned Council could look like and how it could be structured. I had a great discussion with someone who has great experience of the council. They identified what services should be working much more closely together to make them more effective at delivering services (and which would save a significant number of managers). That made me even more convinced than we need to start the process of creating a masterplan for the council and then start bringing service back in house to fit within the new structure. The message to Barnet residents should be one of hope and the genuine belief that without Capita we can have a better, more efficient council that can deliver the best possible services, cost effectively. Last night I attended Barnet's Audit committee. It was a catalogue of Capita failures. Failures to meet the promises made 5 years ago when Barnet decided to appoint this company who promised to deliver services better and cheaper. Last night I said that the council needed to do something now and that doing nothing was not an option. I mused on this further and chatted with people who understand Barnet Council and why the Capita contract has delivered so poorly. The more I talked with them the more I saw Capita's failures in Barnet and their disastrous performance on the stock market as representing a one off window of opportunity for Barnet. Yesterday I asked for Barnet councillors to start bringing key services such as finance and pensions back in house. Today I am asking for something more radical. We have a window of opportunity to think about how we design a local authority from scratch, a blank sheet of paper. Yes, the council clearly has to deliver a range of specific services but how they are delivered is up for grabs and what other services they provide is up for debate. Prior to Capita taking over Barnet, there were established customs and practices, physical and organisational structures that restricted how change was implemented. Some aspects of the service were great; remember Barnet was rated a four star council. Other aspects were poor, often restricted by a lack of investment in good technology. We were told that Barnet could not afford to invest in technology and that is what Capita would deliver. Ironically, as soon as Capita were appointed Barnet found the money for investment and gave it to Capita. The services were outsourced but instead of coming up with a radical and bespoke organisational solution we simply transitioned to Capita's established customs and practices, Capita's physical and organisational structures. Is it any better? Well the evidence suggest it is no better at all and in many ways it is much worse. The recent Children's Commissioner's report criticised Barnet for its "Silo Structures" made worse by outsourcing. The report also said that Barnet was process heavy which slowed down decision making. In the review of the Capita joint venture, Re, the report noted, "Capita’s internal organisational structure (known as “the towers”) has been identified as a layer of complexity that potentially impacts on day to day service delivery". My attention was drawn recently to how the cost of the commissioning function in the council has grown since the contracts with Capita were signed. Barnet are having to throw more and more resources in to managing the contract with highly paid "strategy staff". The commissioning budget has risen from £8 million to over £20 million in three years yet we still don't seem to have enough staff monitoring the contracts. So can we start again from scratch; design an organisational structure that reflects Barnet's needs now but with the flexibility to adapt as the role of local authorities change and develop? We can develop a efficient structure that gives councillors and the public a clear joined up view of the council and how it is performing. That might mean some services are outsourced, typically those that are highly specialised and non-core to the running of the council. But they would be outsourced to market leading specialists rather than "we can do it all" suppliers like Capita. I know some people will say we can't afford it but it is important to distinguish between capital and revenue. Borrowing to invest in services that will save money makes plenty of sense. Indeed Barnet are making many capital investments to save or generate revenue such as the new leisure centres. It is clear to me that the Capita contract is not performing anyway near to the level we were promised. There are lots of extras we are being charged for. But most importantly Capita and the council do not share common goals. With the problems Capita are experiencing now, that goal divergence is likely to get worse, not better, as pressure increases to improve profitability of its remaining contracts. The die hard defenders of outsourcing will trot out all the old phrases but my view is they are living with an outdated and broken model. We need fresh thinking and innovative ideas. If I was leading a party into the forthcoming local elections I would be selling the opportunity to change the way the council is run, to get the best advice for a new and efficient model. A model that suits us, not a remote, corporate organisation going through its own massive restructuring exercise. That means preparing a masterplan for the council with a phased withdrawal from the Capita contract. Indeed, as one of my fellow bloggers mentioned, Capita might be pleased to seek an exit from the JV contract, especially as it is struggling to deliver the promised returns. Bringing finance back as quickly as possible is essential because without control of finance any other plan will struggle. There will be lots of specific questions like, do we need to bring a call centre back to Barnet? There are plenty of organisations that could help set up a call centre quickly in Barnet staffed by people who are connected with the area, who know what services Barnet provide and have a connection with the area. There are lots of specific questions, but what is essential is to have a vision of what a great council looks like. We have a window of opportunity. I just hope we have some councillors who have the courage to innovate and deliver something new, efficient, a new council that meets our needs not those of the suppliers.